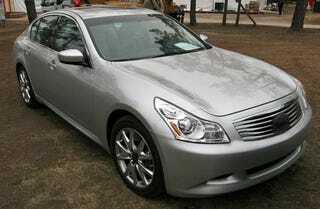 The updated 2009 Infiniti G37S Sedan was spotted yesterday by the folks at Supercars.net out Californee-way, on a golf course, sans license plates. That would make sense considering we're told to expect it to debut at the Pebble Beach Concours D'Elegance this weekend. The updated G-sport sedan looks a whole lot like the current G35, with mild exterior updates to the shape of the rearview mirrors and new wheels. The big upgrade comes under the hood in the form of a bump from 3.5 liters to a 3.7 liter, 330 HP VQ-series engine hooked to a 7-speed automatic transmission — same as in the Infiniti G37 Coupe. Expect to see the G37 Sedan in dealers next month. Also expect to see more spy shots shortly.